EXTREME ULTRA is an ultimate Refrigerant Gas Leak sealant that solves all the problems related to small refrigerant gas leakages in AC/R systems. Errecom projected a 6ml dose leak stop that can work with all types of refrigerant gases. 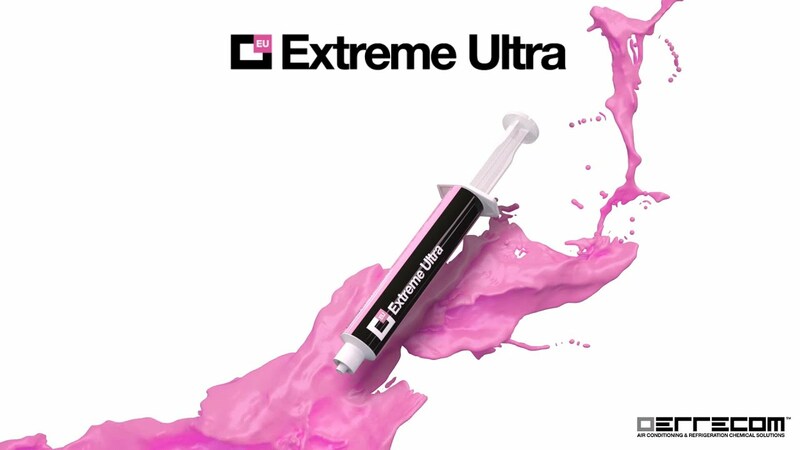 EXTREME ULTRA 6ml new formula treats A/C and Refrigeration systems up to 21KW (6 tons). EXTREME ULTRA locates the refrigerant gas leaks and permanently seals them, without reacting to moisture and oxygen. EXTREME ULTRA is a polymer-free solution that repairs leaks up to 0.3 mm. ERRECOM is a manufacturing Company of chemical solutions applied to the market of HVAC&R. ERRECOM’S products help in solving the most common problems that can occur in Air Conditioning and Refrigeration Systems and in maintaining them. Our R&D department works constantly to offer the highest quality ever, choosing the best raw materials and proposing every year new technologies which are always the most innovative on the market. Our supply chain is 100% Made in Italy or 100% Made in Errecom, we would better say: we then check every single process and component. As a European Company we do endorse tightened laws and protocols which aim at the preservation of our planet: we act, work and produce in a green vision, being aware that there are places and values to be preserved over time. Leak stops, performance enhancers, UV Dyes, Lubricants and Cleaners for Air Conditioning and Refrigeration Systems are among our best sellers, but we have a very complete catalogue. Furthermore, after more than five years of laboratory researches we are now introducing our new ULTRA collection: a maintenance kit for AC/R systems that has substituted most of our additives into low-dose technologies. The 6 mL dose (0.2 fl oz) of an ULTRA additive has been designed to be used in all Air Conditioning & Refrigeration Systems up to 21 kW (6 TONS). This innovation represents a real turning point for OEMs and maintenance workers in the Air Conditioning & Refrigeration Systems market. Indeed, today they can insert more additives at the same time in the same system and this allows to act more quickly and economically on various problems that can occur in Air Conditioning & Refrigeration Systems. This operation is not possible with the old generation Additives, as the proposed dosages do not allow it. Our mission is to make the maintenance of Air Conditioning & Refrigeration Systems as easy, fast and inexpensive as possible.